If printing mostly smaller details on your 3D printer you can easily take advantage of the cheaper white painters tape, however if you only place it in the middle you might have some trouble properly leveling up the build platform. So you just need to add some small pieces of tape where the points for leveling up the build platform are located and you should be able to adjust things much easier and faster. 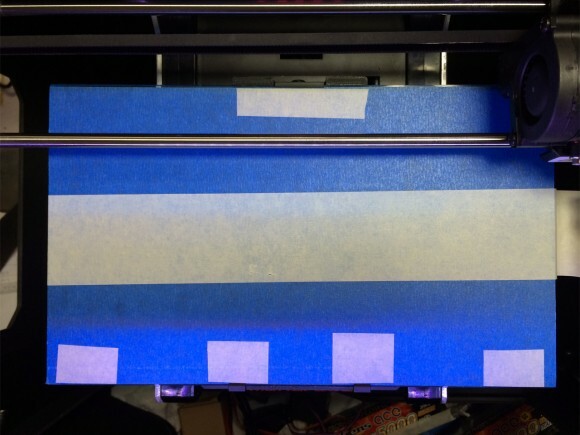 We are using the white painters tape as an easier means to remove the printer parts from the build plate as you can easily remove the tape with the printed 3D model on it and then reapply it on the build plate or replace it with another one. You can do the same thing with the Blue 3D painters tape, but it is more expensive and it is not as commonly available as the white painters tape.